Apostolis Thimiopoulos was in Athens on the 20th March. 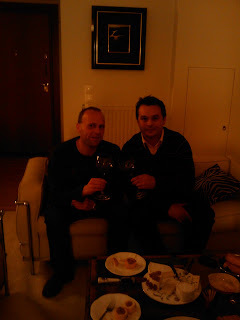 He flew in from Thessaloniki and had a meeting with US wine importers at the Grande Bretagne Hotel in Athens. I picked him up later in the day in Kifissia and we drove to my home. I prepared some stuffed lemons and we also enjoyed some crayfish and a selection of cheeses with fresh bread. I opened a bottle of 1999 Falletto from Giacosa and we had a lovely time. Apostolis is currently completely sold out of his 2006 Ghi ke Uranos. The 2007 will go on sale in September, so all we can do is wait for its official release. His export market is very healthy indeed, and his wines are particular successfull in the US, where it is sold by the name Uranos. He kindly brought me bottles of the 2006 and 2007 vintages, both which are stunning wines, 100% Xinomavro. We only had a couple of hours before he had to go to the airport, and we had a lively discussion about Greek wines. Apostolis is very passionate about the work in the vineyard and this is certainly reflected by the outstanding quality of his wines. Hallo, I found your blog and this post on Ghi Ke Uranos yesterday when I had to organise a tasting for a friend and Ghi Ke Uranos was part of the bunch. It is a great wine and I found your info (and your taste for Italian wines...Barolo Falletto di Bruno Giacosa) very interesting indeed. If you know where to find this wine (I live in belgium) please let me know. I would also like to visit the area of Naoussa and if you have suggestions I would be very interested.